There is no parking but many public parking around. There is resroom. Open: 6:00 (the middle of March to the middle of September) other 6:30. 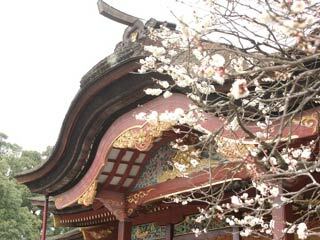 Dazaifu Tenmangu is located on the grave of Sugawara no Michizane who is considered as the god of the education and wisdom today. Mihizane was born in Kyoto in 845. He was very genius since he was very young. He succeeded as Scholar, politician and writer. He became the Minister of the Right in Japanese imperial court, but later he was politically lost his position and demotioned to Dazaifu. He was moved to Dazaifu and died in 903. When he died, his body was carried by a cow-cart. At some point, the cow stopped moving and never moved again. People thought it was the will of Michizane and they buried where he stopped. That is current location of the main hall of Dazaifu Tenmangu. His grave was made in 905, and the shrine was established in 919 by Emperor Daigo. Later, he was proofed his innocence and entitled “Tenmandaijizaitenjin.” The most commonly, he is known as “Tenjin-sama.” Since then, he was highly respected as the god of education and wisdom. Tobiume is a plum tree located right next to the main hall. This plum was planted in Michizane’s garden in Kyoto. When Michizane was moved to Dazaifu, this plum followed him all the way from Kyoto to Daziafu in one night. Poem of Michizane when he was demotioned to Dazaifu. There are many camphor trees in the area, and the one of them are over 1,000 year’s old. Kyokusui no En : First Sunday of March. Spring Matsuri: in Spring Equinox. Kamigami no utage: in September 20 to 25. Special ritual ceremony for Education: October 18.